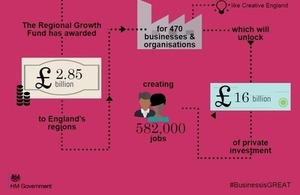 In total, £2.85 billion has now been invested in regional companies, helping them to expand and take on more staff. Businesses across all industrial sectors will benefit from the funding, with over £1.1 billion being invested in manufacturing, including £364 million in automotive, £100 million in aerospace and £104 million for low carbon enterprises. Today, the RGF is backing British-based business by awarding 63 new projects and programmes across England with a further £297 million. The investment from the RGF will fuel business expansion and is expected to unlock £1.5 billion of additional private sector investment and create or safeguard thousands of jobs. After decades of regional economies being neglected I set about investing directly in local businesses via the Regional Growth Fund. This investment has allowed regional businesses to be more ambitious than ever before and gone a long way in creating a stronger economy. A stronger economy means providing equal opportunity for everyone across the UK, rather than solely relying on the city of London to bolster UK business. The success of the RGF is proof that putting money in the hands of local businesses helps them flourish and creates opportunities for more people to work locally. For every £1 the government has invested through the Regional Growth Fund, the private sector has put in £5.50, meaning the total investment is now expected to attract £16 billion of private sector support. Over 100,000 jobs have already been created with a further 480,000 expected by the mid-2020s. Ministers will be visiting RGF projects across England today (12 February 2015) to see how the fund is helping to rebalance the economy. We have invested more than £1.1 billion in British manufacturing businesses outside London to grow and create jobs in sectors spanning aerospace, automotive, low-carbon and chemicals. Today’s investment supporting businesses like Brose will boost British manufacturing, exports, and opportunities to innovate, impacting companies positively for a decade and beyond. The government is supporting local businesses and enterprise across the country, helping them to expand and create long-term, skilled jobs. This latest round of RGF investments will help local firms fulfil their ambitions for growth, encourage businesses to set up bases in the UK and boost jobs and prosperity. Launched in 2010, the RGF stimulates enterprise across the country by providing? ?grants to projects and programmes with significant potential for economic growth,?? ?leveraging in private sector investment and creating or safeguarding jobs. This latest funding announcement comes from Round 6 of the Regional Growth Fund (RGF) and the Exceptional Regional Growth Fund (eRGF).